The awesomeness of summer’s harvest has been almost too much to take in lately. As the girls and I were out in the garden yesterday picking warm juicy tomatoes and pulling up carrots and baseball-sized beets, still clinging with earth, our oldest daughter said, “It’s almost too much of a good thing.” I glanced quickly from bowl to bowl of just picked tomatoes. And I had to pause. Her 12 year-old perception was spot-on. But that’s the beauty of this time of year. Even though we have a small garden, we simply cannot consume all that it produces. So we eat what we can, at each and every meal, and leave little bowls and bags of fresh goodies on the doorsteps of our friends and neighbors. Then we either freeze or make pickles and jams with the rest, determined to preserve every last morsel of hand picked goodness. Now, peaches are something we don’t grow ourselves. Each year we order a box from Oregon’s Harry and David or our church’s youth fund raiser that sources their peaches from Colorado. They are always fabulously sweet and run-down-your-arm juicy. But we simply can’t eat the whole box of fruit before their quality starts to wane. So this year we made a couple loaves of our favorite Peach Bread. And then a few batches of this Peach and Vanilla Bean Freezer Jam. Pure heaven! We had never made peach jam before, but a version with fresh vanilla beans has been on my list for the past couple of years. While we were on a family vacation to Seattle earlier this summer, I was nudged to finally give it a try. My family became quite smitten with Tom Douglas‘ restaurant and bakery menus during our week in the Pacific Northwest. On the morning of the 4th of July, Serious Pie & Biscuit was buzzing with a holiday breakfast crowd. My individual cast iron dish of eggs with spinach, pesto, and feta was sublime. 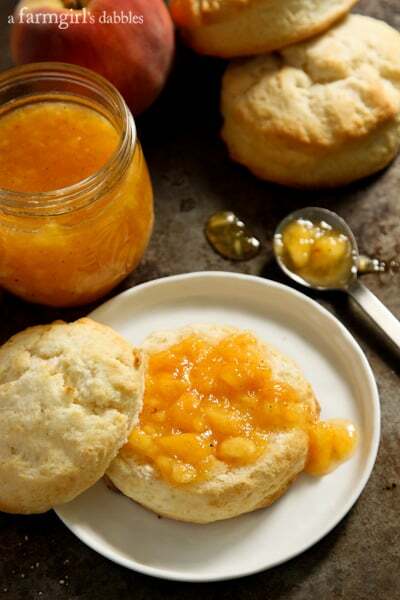 And those buttermilk biscuits were some kind of amazing, just the perfect canvas for shmearing on some soft butter and a big sweetened-just-right spoonful of peach vanilla jam. We ate in the upper loft space that morning, which afforded a fabulous view of the kitchen and bakery below. This bakery is where the magic happens for all of Tom Douglas’ restaurants. 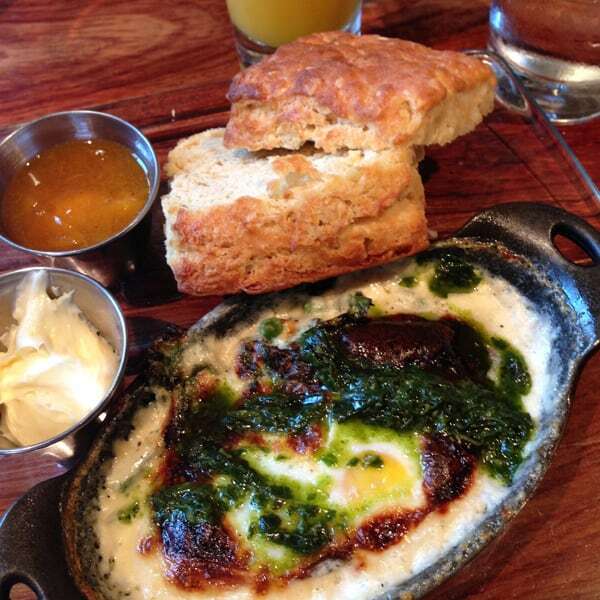 If you’re ever in Seattle, I highly recommend you check out more of what Tom Douglas has to offer. 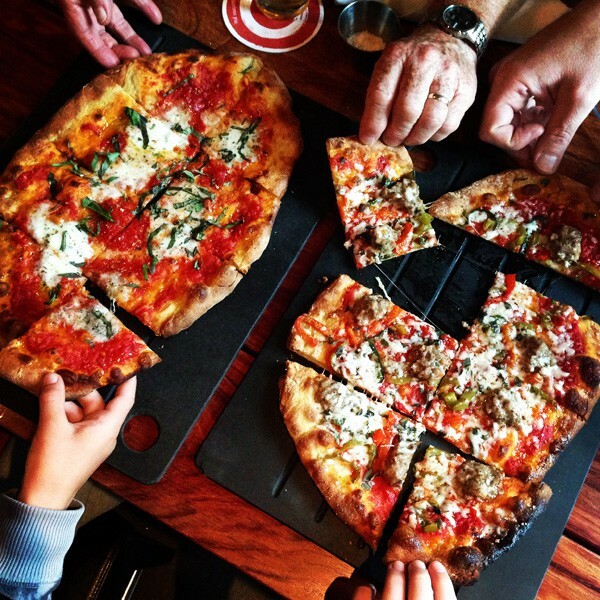 Share a couple woodfired pizzas (they have an incredible crust that I still dream about!) and cold local brews at Serious Pie & Biscuit. And if you’re looking to indulge in a special meal, you can’t go wrong with Dahlia Lounge. The roasted five spice duck completely lived up to its hype. Even the broccoli was insanely memorable! 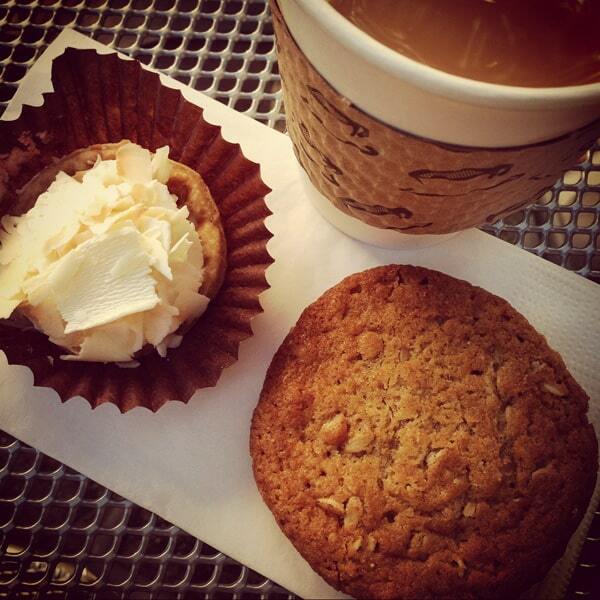 Right next door to Dahlia Lounge is Dahlia Bakery. Again, not to be missed. I had to try the peanut butter sandwich cookies I had heard so much about. They were perfectly peanut buttery. And just plain buttery! And I gave in to my second helping of their famous triple coconut cream pie (also served at Serious Pie & Biscuit), happy to find them in mini portions here at the bakery. Yum. Yum. YUM. My version of peach and vanilla bean jam is, I believe, very similar to that served at Serious Pie & Biscuit. It’s naturally peachy, not overly sweet, and softly kissed with vanilla. It has a loose jam consistency, much like I enjoyed on my Seattle biscuit, although with smaller crushed fruit bites. The restaurant’s jam had larger pieces of peach, which I adored. But I knew our family would like the peaches broken down a bit more, so I took my potato masher to the jam mixture. 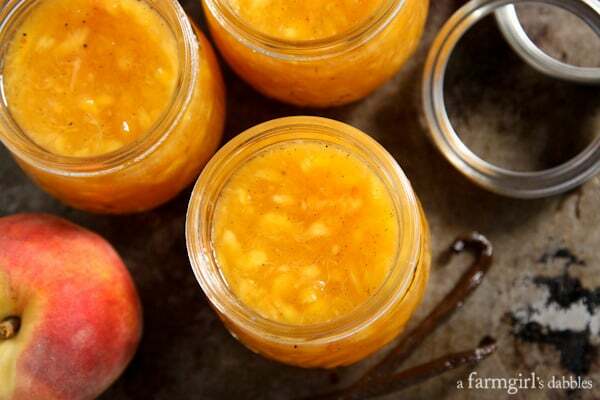 This fresh peach and vanilla bean freezer jam is easy to make. And even easier to become a favorite. My family has fallen in love with it. I hope you’ll give it a try! Note: This is not a thick jam. It has a loose jam consistency, much like I enjoyed on my biscuit in Seattle, although with smaller crushed fruit bites. 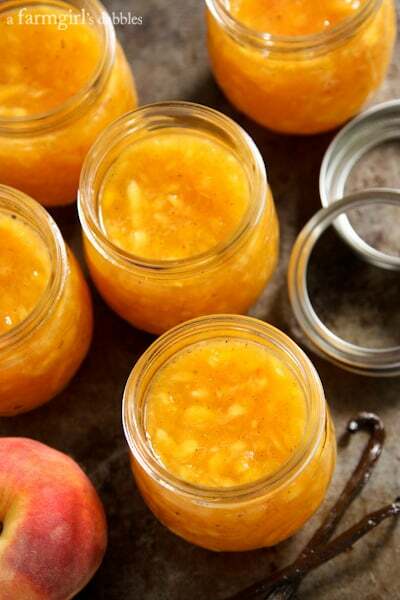 If you are looking for a thick peach jam, this is not the recipe! Wash 6 half-pint (1 cup) containers and lids with hot water and dish soap. Rinse and dry thoroughly. Set aside. In a large bowl, combine crushed peaches, lemon juice, and sugar. Stir to combine. With the tip of a paring knife, scrape the seeds from the vanilla bean and add the seeds to the peach mixture. Stir to combine, breaking up any clumps of vanilla beans. Let stand 10 minutes, stirring every couple of minutes. In a small saucepan over high heat, stir together water and pectin. Bring to a boil, stirring constantly. Boil and stir for 1 minute. Add pectin mixture to peach mixture and stir constantly for 3 minutes, or until sugar is dissolved and no longer grainy. If a few sugar crystals remain, that’s ok. Immediately fill containers to within 1/2” of container tops. With a damp paper towel, wipe off the edges of containers. Immediately cover with lids. Let stand at room temperature for 24 hours. Because this jam does not go through the full canning process, it must be stored in the refrigerator or freezer. 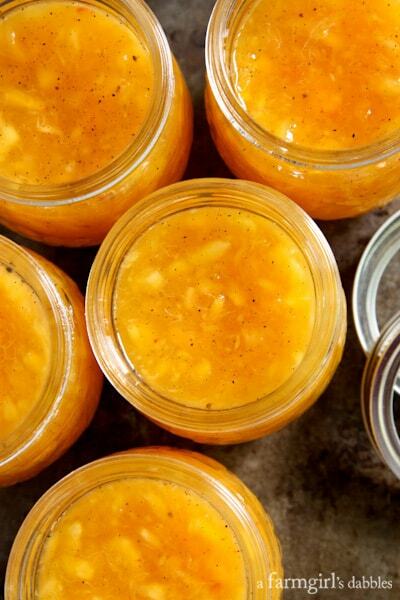 Jam can be used immediately and then stored in the refrigerator for up to 1 month. Freeze extra jars of jam for up to 1 year. Thaw in refrigerator before using. 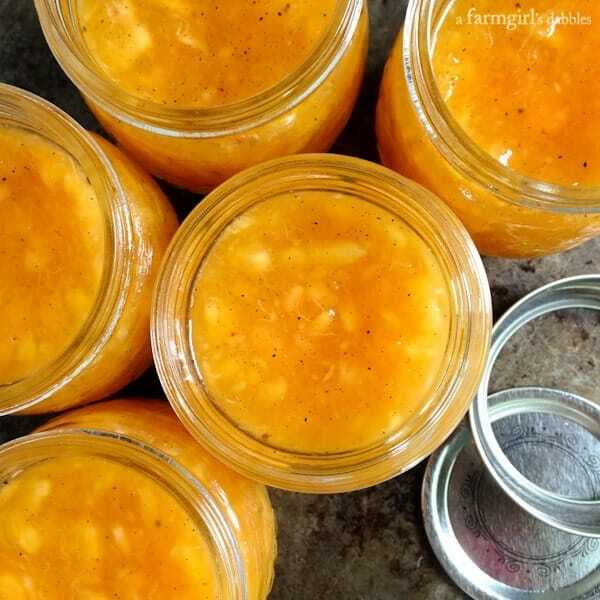 Basic peach vanilla freezer jam recipe from SURE-JELL, with adaptations from a farmgirl’s dabbles.